This is a fun book that describes itself as having all of Catbug’s secret treasures and oregano dreams… so you automatically know that you, as an adult, will not be able to make sense of this book. No actually it’s a scrapbook put together by Catbug. In it are his thoughts, memories, and random pictures. Each page of the book is dated so readers can chronologically track Catbug’s day to day life. I can’t tell you how children will respond to this book, but I actually think this would be a pretty suiting gift for that adult person-you-kinda-know so you buy them a book from Urban Outfitters. On one page is a picture of Catbug who is coated in sugar, floating over a fire that appears to be made up out of his friends. Catbug is shown with a speech bubble that reads, “Friendship feels toasty!” A few pages later, Catbug lists his rules for life. Number 1 is, “Turtles are not hats. Do not wear them. No matter how much fun it is. They don’t appreciate it.” This is pretty funny. Catbug’s memories are also told as stories, madlibs, and more. Some pages contain blueprints, others are designed to look like typewriter paper, and many pages look like those from an illustrated story book. You could probably read this book in any order you want. Seriously, buy this book and flip it open. Read from there… see what I mean? There are some stories in this book, but they’re only a few pages long and many of them end in “TO BE CONTINUED,” as if Catbug lost his train of thought. 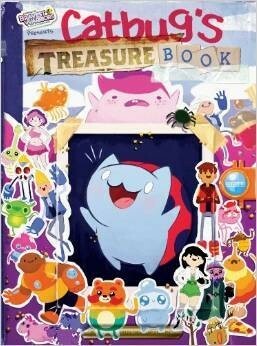 I think this is a cute book and would be great for any young fan of Bravest Warriors. It’s well produced and printed on a good quality paper stock. The book’s interior layout is well done and easy to follow which is a thoughtful contrast compared to how random Catbug is. It is printed in Canada and they finished it off with a matte finish cover that makes this book feel durable. That also means no disgusting fingerprints after you are your child have flipped through the book a thousand times.